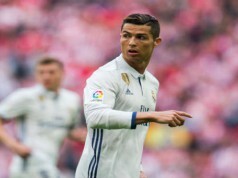 Real Madrid put pressure on Barcelona as they beat Athletic Bilbao at the Santiago Bernabeu thanks to goals from Cristiano Ronaldo (2), James Rodriguez and Toni Kroos. Zinedine Zidane men didn’t play their best game, as the hosts controlled possession during most of the time. But Los Blancos were more effective and extended their perfect run at the Santiago Bernabeu since Zidane took on the manager job. 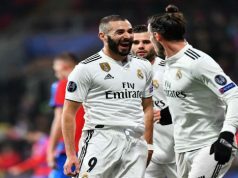 Los Merengues took an early lead as Benzema sent a pass into Ronaldo, who beat his full-back and fired one into the top corner with only two minutes on the scoreboard. It didn’t take long for Athletic to level. Eight minutes later, Raphael Varane made a terrible mistake when trying to pass the ball back to Keylor Navas. The Costa Rican was only able to tip it into the path of Eraso, who netted from close range. Aritz Aduriz had two superb chances for completing the visitors’ come-back. First, he was brilliantly denied by Navas after sending a great header to the top corner. Minutes later, his shot hit the bar after receiving a pass from Balenziaga. Athletic exerted a high pressure on Real, and Los Blancos struggled to control possession. However, James Rodriguez rescued the hosts in their worst moment. The Colombia international showed his quality with a superb shot from almost 30 metres. Iraizoz was unable to stop the midfielder’s effort into the bottom corner. Right before the break, Toni Kroos made it 3-1 after receiving a pass from Ronaldo inside the box and firing one past Iraizoz. Athletic kept fighting in the second half and had several chances to shorten Los Blancos lead. Aduriz was close to scoring as he found himself one-on-one with Navas, but the stopper was out to make the save. Things became a bit more complicated for Madrid as Varane was unfairly shown a second yellow card with eight minutes to go. However, Athletic were exhausted and Ronaldo ended up sealing the win after receiving a long cross from Lucas Vazquez and firing a super shot to the top corner. Elustondo scored in stoppage with a brilliant header to make it 4-2.